What's New @ Roselle Public Library: Join the Big Library Read! Join the Big Library Read! OverDrive's Big Library Read, the world’s largest global eBook reading club, is happening now through March 30. The current selection is Art of the Pie, one of 2016’s best cookbooks from pie-guru Kate McDermott. Join the discussions about the cookbook, find recipes and more on BigLibraryRead.com. The free program runs for two weeks. Download the eBook from eMediaLibrary. To get started reading, all you need is your Roselle Public Library card and PIN. Art of the Pie can be read on all major computers and smart phones and tablets without worrying about wait lists or holds. The eBook cookbook will automatically expire at the end of the lending period, and there are no late fees. The Big Library Read program is made possible through a partnership between Roselle Public Library, OverDrive and Countryman Press, publisher of Art of the Pie. 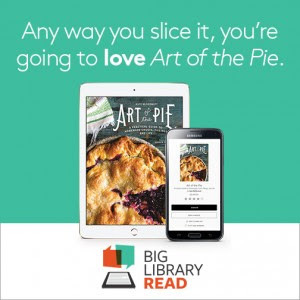 Library readers voted Art of the Pie as their cookbook choice for Big Library Read. To borrow the eBook, readers can visit https://emedialibrary.overdrive.com/emedialibrary-roselle/content.